New Year's Eve, 1940: Evie Chase, the beautiful debutante daughter of a rich and adoring RAF commander, listens wistfully to the swing music drifting out from the ballroom, unable to join in the fun. With bombs falling nightly in London, she is determined that the coming year will bring a lot more than dances, picnics and tennis matches. She is determined to make a difference to the war effort. 5th January, 1941: Evie curses her fashionable heels as they skid on the frozen ground of her local airfield. 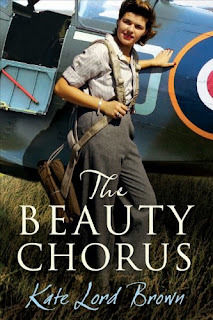 She is here to join the ATA, the civilian pilots who ferry Tiger Moths and Spitfires to bases across war-torn Britain. Two other women wait nervously to join up: Stella Grainger, a forlorn young mother who has returned from Singapore without her baby boy and Megan Jones, an idealistic teenager who has never left her Welsh village. Billeted together in a tiny cottage in a sleepy country village, Evie, Stella and Megan must learn to live and work together. Brave, beautiful and fiercely independent, these women soon move beyond their different backgrounds as they find romance, confront loss, and forge friendships that will last a lifetime. A couple months ago, Karen (Sassymonkey) sent me an email telling me that this book looked to be right up my alley. She was right! I had recently read the non-fiction book Spitfire Women of World War II and this was a good companion fiction book to move on to next. I just had to get a copy because I had all ready ordered books recently when this book came out, so when the cc ordered online I convinced him to add this to the order. Between Karen telling me about it, mentions of the book online, and the fact that the cc actually bought me a copy... I knew I had to read it right away! It's because of books like this that my reading has been suffering of late. It was really good! I have always been fascinated with female pilots. I think it is because in the back of my mind, I have always wanted to learn how to fly a plane myself. I am not sure if I ever will, so in the meantime it is fun to live through the lives of other women who had the chance. This book predominately follows the life of Evie Chase. She comes from a rich background, so has lived a rather sheltered life. Now, though, she has decided to make a difference in the war. While at a party for New Year's Eve she meets a man that sets that whole dream in motion. She gets off to a rocky start, but soon she is taking to the skies in model after model of plane. Through her, we can understand just how difficult and risky this life was for the women who lead it. They were equally as brave as the men who flew, even if it was not in combat. The men had much better training than these women did at most times. The book also looks at Stella Grainger and Megan Jones. They are roommates with Evie, so they add to the story. Stella is suffering through a lot of guilt and Megan is very naive. It is an interesting contrast. Especially when you add Evie to the mix! You get to see the lives of these three women intermixed with their jobs as pilots. It brings a human touch to the story of women pilots. Brown also works in the tragic death of one of the most famous pilots, Amy Johnson. She was covered extensively in the Spitfire Women book if anyone is interested. There are other books, but I haven't read them yet to be able to recommend them. I am very glad that I read this book. It is really well-done and I got quite caught up in the story. The author did a very good job and I recommend this book strongly. Awesome review of this one. I want to read it big time as like you I have often dreamed of flying a plane. I tried to get this from netGalley but they are currently only approving Canadian readers and librarians. This sounds fascinating--I'm putting it on my tbr list. Thanks! Oh this sounds wonderful!! I want to read it now! I see the book Tatiana and Alexander in the 'links you may like' section at the bottom of your post, and it reminds me that I bought that book because of your review so long ago! Now I really need to read it! Where does the time go?